"The nice thing in high-fashion is that you can dress for the occasion, everywhere and always. 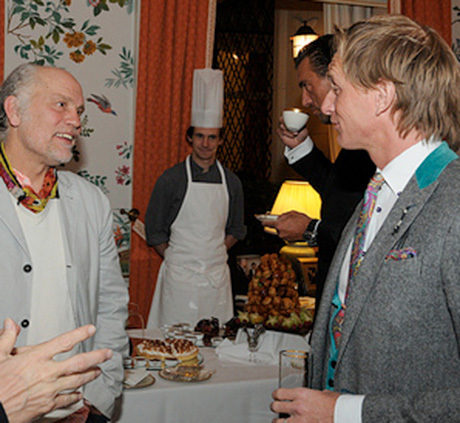 That's a very important aspect in the daily life of the stars and celebs for which we cater as a couture house." 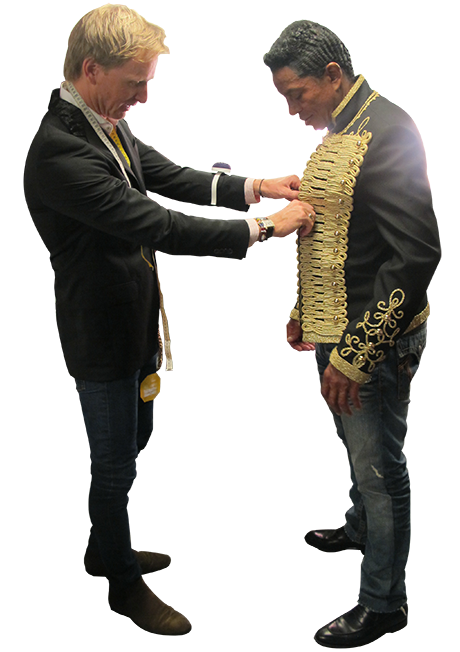 Lenny Kravits & Jermaine Jackson during final suit fittings. The list of pop-stars, Hollywood icons and others alike that have been / are being dressed by Stijn Helsen is almost endless. They all have one thing in common: they're passionate about the style, philosophy and the brand identity of the impassioned designer Stijn Helsen. The Jacksons, John Malkovich, Robbie Williams, Jean-Claude Van Damme, Seal, Hugh Grant, Michael Schumacher, Princess Claire of Belgium, Prince Laurent of Belgium, ........ are just a few people on the list of iconic names that have given in to the SH touch. When it comes to bespoke suits with a unique aspect, elegant jackets, couture skirts and dresses or selected accessories stars and celebs opt for Stijn Helsen, for the undeniable SH touch. "The Jacksons, John Malkovich, Robbie Williams, Jean-Claude Van Damme, Seal, Hugh Grant, Michael Schumacher, Princess Claire of Belgium, Prince Laurent of Belgium, .... When it comes to bespoke suits with a unique aspect, elegant jackets, couture skirts and dresses or selected accessories stars and celebs opt for Stijn Helsen, for the undeniable SH touch." The elegance and uniqueness of the Stijn Helsen creations definitely appeals to people around the globe. 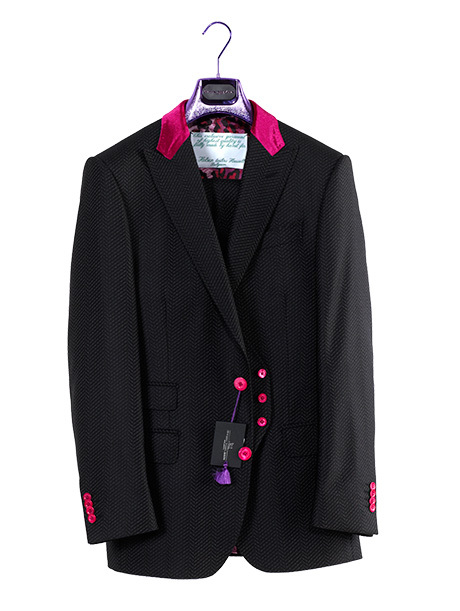 Robbie Williams ordered several handmade suits for him and his guitarists Neil & Gerry. Seal in turn loves the sharp cut pinstripe suits by Stijn Helsen while Jean-Claude Vandamme loves the colorful aspect of the SH creations. Also, 'The Jacksons' are absolute fans of the Stijn Helsen suits: they have about 170 different SH suits because they want to be dressed to the occasion, wherever they go, whenever they want. Stijn Helsen leaves no (high-fashion) heart untouched. 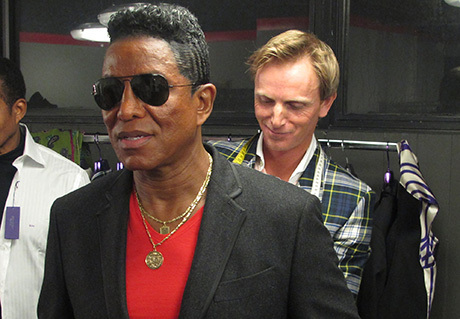 Suit fittings with Jermaine Jackson and brothers backstage at the concert. Stars and celebs are busy people. That's why Stijn Helsen gives busy clients the opportunity to do suit fittings in Miami, Basel (during Art Basel), in Los Angeles (during the Oscars) or in London and Paris by appointment. All fully assisted by the designer himself.